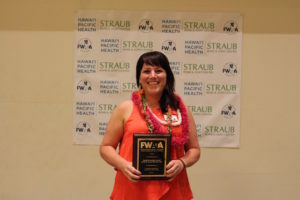 On July 15th the Far West Athletic Trainers Association presented Sarah Lyons MS, ATC, PES with the 2016 Special Recognition Award at the awards banquet during the FWATA Annual Meeting and Clinical Symposium in Kona, HI. Sarah was nominated by her colleague Matt Mills, MA, ATC, PES, CKTP with support letter from Stanford Head Women’s Gymnastics Coach, Kristen Smyth, Director of Athletic Training, Scott Anderson MA, ATC, FMSC, DNSP and District 8 Director and Head Athletic Training of San Diego Christian College, Carolyn Peters. “Sarah has dedicated a large amount of time to the advancement of FWATA and her contributions are invaluable for the growth and continued success of FWATA. She is strongly deserving of Special Recognition, and is someone who FWATA should honor.” writes Matt. The Special Recognition Award is to recognize those Certified Athletic Trainers or a non-members who have and/or are making a significant contribution of their time and energy to FWATA. They are actively working in some capacity towards the betterment and promotion of FWATA.